Two teams vie for control of a designated planetary location by destroying the enemy Mobile Command Center (MCC) in the area while protecting their own. By capturing and maintaining control of NULL cannon installation components, a team is able to increase the amount of damage done to the enemy MCC. The more NULL cannons held, the faster the enemy MCC takes damage. The battle is over when one of the MCCs is destroyed. looks like you guys shortened the map so that the northern enemies can't spawn camp the enemy MCC in skirmish unless i'm looking at the ambush version of the map. that was my only complaint for this map. Yep, if this is the new redline area, sweet. I'd love to see a fourth control point put in in the north east section and then probably moving the spawns around a touch to make sure it stays balanced. Or just putting C over there and putting A where C is. Yeah I would like to see a little shuffling of the Null Cannons. A- Needs to be moved between its current location and where C is, by the rocks in the center of the map just below the the road to C.
C- needs to be moved to above those silos in the NE, around where the roads met up there. Purely anecdotal but this map seems to slighter favor the southern team. In ~2/3 of the games I've played the team that spawns in the south is the first to gain 2 NULL cannons and goes on to win the game. The impression I have is that the effective (i.e. not as via the air) distance to the points is slightly longer for the northern team. This has held true for my games on this map regardless of where my team spawns. Can any other testers provide their impressions on this subject to confirm or dispute this impression? High Res link is broken. EDIT= Remove the + symbol at the end of the link and it works. I agree with moving the null cannons around except for B, its perfect there, and add a 4th cannon. As is, from my all the times I've played this map, most of the combat is between C and A with A being better to defend only due to its higher elevation but only if your on the team that spawns to the south. As for Ambush, its great. The only problem is that there are places on the map (mountain) where a sniper can not be killed by a sniper rifle. Although the head sticking out from behind a hill and shields flicker. And still solve the problem of the possibility of murders players are in MCC (on all cards this going on) and they can not even answer. must install turret so that it prevented free passage MCC. 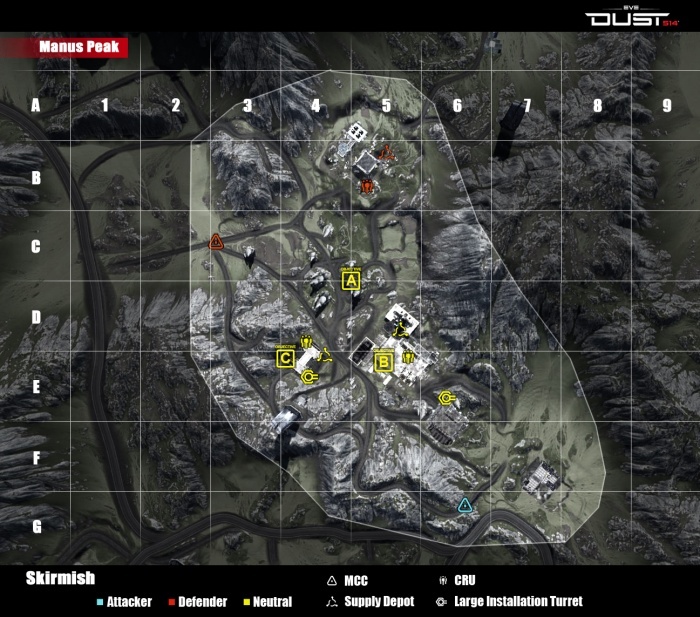 My Problem with this map is that there is hardly any cover nearby to block Missle fire from Dropships and Sniper fire. As a Logibro I move as effectively as i can across this map to avoid hostile dectection and still feel like i got lucky if i didn't get killed while crossing the street. I almost always get shot at. It also seems to me that on the left half of the map where the (terrain is slightly elevated near the street, that cover is alot more scarce and your much more vulnerable to... well everything. The terrain dips on the right half blocking you from Snipers if you use the Cragspires right. While on the other side it seems like not only is it alot more open but there are also fewer or smaller cragspires. Maybe i'm just a tiny bit paranoid though. A/B MCC may need to be relocated. 1. Starting advantage to hack B slightly sooner. 2. Enemy team can spawn kill those who drop from MCC. This is a great Skirmish map, my favorite one of all, with 3 Null cannons to hold, especially because each one takes a bit of a tough journey to get to at times, especially if enemy held. My only problem with this map is that it shouldn't be an Ambush map. People thrive around at Supply Depots for too long, no one moves around, and the map involves too much movement from one place to another to get kills. The maps favours snipers, and that's good, but I would like to see the map me Skirmish only. You can tell the map was meant for positional advantages and strategies, with the rocky and tough landscape - everything Skirmish should have in it. Use the MCC spawn as the crow flies and you'll see the problem. The southern team's MCC spawn is much closer to Bravo than any comparable spawn for the northern team. In fact, the northern MCC spawn is useless in that it's farther from any of the objectives by any type of estimation. Alpha is also a lot more defensible for the southern team than Charlie is for the northern. That's because the great big mound of earth channels enemies into basically a single path. You can run around, but you will be seen doing it and even if you do get around the corner alive you still have to contend with having the enemy team's high ground advantage on the western hills. Climbing up the western hill at Alpha is impractical because of the pathing problems. Any competent team will gun you down if you're coming from there. Meanwhile, there are about three practical channels into Charlie which are relatively effective. You can't attack Charlie from the north very easily, granted, but the southern and eastern channels are much wider and yield the defenders little high ground advantage. Even wrapping around from the north is somewhat more practical than trying to wrap around Alpha from the south. The only cover south of Alpha is that hill side. If you post up there, it becomes a fight on two hills that you will definitely lose. Meanwhile if you post up north of Charlie the sloping ground gives the defenders much less help. Overall Charlie is just more open. That's in no way to say that the map is horribly unbalanced or anything. It's just a bit of a sweep of analysis. The biggest problem is that MCC spawn that's so close to Bravo for the attackers. this map is far from balanced. the bottom gets redlined nearly every time with the spawn points so close and the map so small it doesn't take a lot to redline. the top side has a whole cliff side that belong to them while the bottom can be camped really easily. if you own the three points and hurry to head off the enemies it is nearly impossible to dislodge them from the points and even harder to get vehicle support. if there were some CRUs or something to help balance the map out it might work out, placing some clone units near the silo looking buildings or where the supply depot is in the ambush version might help out balancing along with moving the red line around a bit to help the bottom out so they aren't fish in a barrel. Is it just me or is everyone else getting this map 3 out of 5 times? I think either a 4th point should be added or the spacing of C and A needs to be worked on. They are too close together and their design seems to favor the southern team more than the northern team. Example being, A has the high ground and can rain sniper fire on C while C doesn't have an natural advantage over A.
I like the dynamics of this map as an actual "Attacker" vs "Defender" map. The folks that Spawn on the South are clearly defending their territory. CCP has done a very good job of creating the sense of an "uphill battle" with this map. The Attackers have a disadvantage as they have to attack uphill, and have a bit further to travel. Not all battles start out fair. When these battles are to actually decide the fate of districts it will be important to know that Attackers start on one end, Defenders on the other. Attackers may have fewer resources available, and must plan accordingly. As people work in Corporations and Alliances you can bet that strategies for each map will be devised to overcome some of the shortfalls. In the current state of testing, I can understand why the balance feels off... it is because it is... and I believe that is by design. Only CCP can confirm or deny that though. I think it is actually a bold and brilliant design choice, myself. Indeed, it plays as an attacker/defender map with the attackers in the South Spawn being severely impaired due to the terrain. It is a map that two classes dominate way too easily... snipers and vehicles. Leaving everyone else with a horrible gameplay experience. - Add more structures and buildings to break up the clear lines of sight from one edge of the middle basin to the other. - Raise the southern portion of the map (Southern spawn area) to almost even with the rest of the map and reduce the ridge line that separates it from the rest of the map (keeping it from having an advantage due to height). Now, CCP has removed the staged style of gameplay in favor of the current form of Skirmish I am told. This map is clearly an attacker vs defender map with the defenders being the Northern spawn, the attackers being the Southern spawn. Due to the terrain... the attackers have a "Hamburger Hill" scenario if they do not capture objectives quickly. If they lose them, they lose the battle. Any LAV's pushing out are quickly taken out with militia swarms, any drop links they throw out are quickly camped or disposed of. The reason for this is the defenders holding the top of the Southern Ridge do not need 16 players to suppress the attackers. 2 or 3 over at the Southern MCC kill most of the clones before they even hit the ground. 1 or 2 swarms keep LAV's at from hitting the ground as well, and 2 or 3 snipers do the rest. Add a tank or drop ship with only 2 players in them... you are now looking at about 8 players spawn camping 16 quite easily. Due to the height advantage of the Southern ridge and the ability to simply back up a few steps for cover. Attackers must run up hill with little cover and usually are picked off by sniper fire before they reach the top. Feel free to disagree, but this is the most common scenario I witness on this map in Skirmish mode. I feel exactly this way too. It's just too easy for one of the teams to get 2 objectives right away and start dominating. Also, as someone else said, maybe a 4th objective would be a good idea. I think that having only 3 makes maps a bit too stale and predictable. it is predictable, either top side or bottom side dominates. i have seen countless times where the top side struggles slightly in the beginning but as soon as AB and C are controlled it's over. the enemy has a slim chance to get out of it, and that is to try and take a point before they are shut out back into their base. swarm launchers pepper the land for any LAVs that might try to sneak through and snipers proceed to pick them at their base. i have actually perched myself staring into their base and start destroying vehicles as they try to call them in making sure their stay is permanent. like STYLIE77 and i said, there needs to be more buildings and CRUs on the map to balance it a bit. I'd have to agree this map is simply way to easy to red-line, and the bogus part is it seems to be the most common map in rotation. i have the opposite feeling. being redlined on the southern point happens way too often for my taste. as soon as the three points are capped and everyone on the enemy team has pawned you spawn camp fairly fast. Thanks for your feedback and comments so far, they are very helpful and we have some words from our level design team below about Manus Peak. We'll be doing this on other map feedback sections as well so keep posting! LD: Snipers can be a pain. Some people love them some people hate them. It is a tough class to balance on the field. We are doing all we can to make sure we are giving players a chance. We have some tools inbound to help us pinpoint where a sniper or any other player for that matter can take total advantage of an area. While this wonGÇÖt eliminate them. It will help to find them, and help us to find solutions to those locations. The map has currently undergone some re-design which we have been testing out for a better experience. These changes should be addressing most of your observations. LD: This is something we are looking into. The way our system currently works doesnGÇÖt allow for on the fly orientation adjustments. LD: Manus Peak has undergone a very large re-design. We have ultimately narrowed down the gameplay space and re-focused the start areas for both teams to create a more even battlefield.